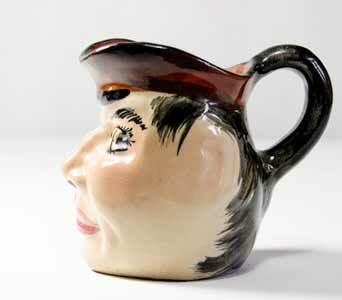 Devon Tors character mug - 5" (127 mm) high. Joseph Nekola joined Devon Tors around 1930 when the Wemyss factory in Scotland closed. Torquay is the generic name for the many potteries in South Devon that made red earthenware pots - usually quite small - with slip decoration in the form of a picture. 'Motto ware' forms the bulk of what we recognize as Torquay. The predominant names are Watcombe, Torquay Pottery (also known as Royal Torquay Pottery), Aller Vale and Longpark, although there were many others including some that were not in or even near Torquay, such as Crown Dorset. The designs on the motto ware often depict cottages, flowers and boats, and the mottos themselves are usually written in the Devon dialect. These pieces were made as souvenirs, but not always souvenirs of Devon. Many collectors have started by collecting the motto wares, and have then gone on to realize that many other styles were made.